Nicholas Provenzano is one of my favorite folks on Twitter. He’s always sharing interesting ideas. Why, then, can’t he make use of Dropbox’s new drag-and-drop features? His district won’t allow him to install a browser besides IE. Miranda Kuykendall adds that considering IE’s security issues, her district also won’t allow its teachers to install anything else. Teachers are entrusted with the care of the children in their classes. Why are they not entrusted to be sensible about what software they install on their own computers? 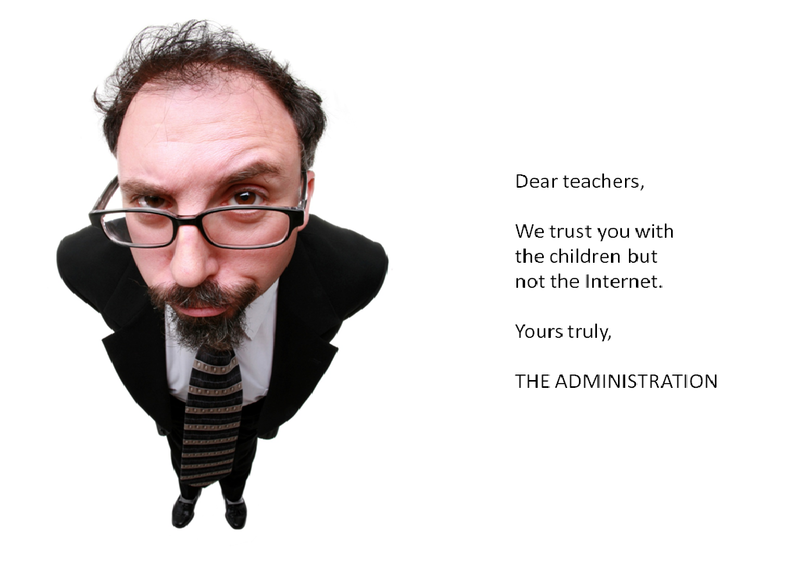 Teachers should be allowed to download Firefox, Chrome, or Safari if they wish. If I had to use IE at work, I’d raise hell about it. Well, that’s not true. I am not a hell-raiser. But I would complain. A lot. And bring my own computer to work (I already do, but not because I have to use dodgy browsers). I hate IE with the white hot fury of a thousand suns, and if I were forced to use it for any reason… it’s too terrible to contemplate. Let me say no more. The argument might be made that teachers will make bad choices or use their computers inappropriately if they were given administrative access to install software. I can’t really argue with that—they might. Teachers should be educated about the importance of being good stewards of their technology tools, one aspect of which is knowing which kinds of software are safe and which might be unsafe or unstable and introduce problems with their computers. In the eight years I have worked at my school, I have always had administrative access to my own desktop. I have always been able to download and install whatever software I choose. In those eight years, I cannot think of a single instance when I’ve heard that a colleague of mine downloaded inappropriate software or used their computer in an inappropriate way. I would hate to think that because of short-sighted folks at the district level, teachers are cut off from innovation and are subject to using software they don’t like because it is the district standard. Given the great responsibility with which we endow teachers every day, cutting off administrative access to install software is insulting. We need to decide if we trust the adults we put in the classroom. If we don’t trust them to take care of their tools properly, given administrative access, then why are we trusting them with their students? It's not just schools that have this kind of tight control. My husband's law firm has this sort of security. He's a full partner, but unable to change things up. Unlike the teacher's you site, he can request items and their IT folks are pretty responses and helpful. I think the firm's case they are very concerned about security for their clients. Two years ago as we got ready to decide where my oldest would go to high school, I could remember being frustrated by the zero tolerance policy for any electronics that the public system had. Even then there were so many wonderful applications to help students learn to organize better (just the simplicity of being able to photograph assignments off the board in a class). There is a similar policy in the district where I teach. In fact teachers cannot even download the software that comes with our text books to our computers. I can understand the issues with security, but it's so frustrating when we are continually being advised to integrate technology and yet we have so many restrictions and no tolerance technology policies that it is almost impossible to truly utilize the technology for educational purposes. Nothing other than IE–"it's more secure"
So many great sites are blocked and unblocking from the district takes time, without any guarantees. What bothers me is the district mission involves preparing students for the 21st century, yet I feel so limited. What is difficult is how to know how to encourage change diplomatically when those making technology decisions are IT people with little or no knowledge of curriculum. I do wonder how I will meet the demands of the Common Core with the heavy emphasis on digital writing, research, and collaboration in such a short-sighted digital environment. My district has a very restrictive policy as well. We're only allowed IE. Any additions to our computer in terms of software (yes, even the cds that came with our textbooks), must be loaded by IT guys. Additionally, we have very restrictive security filters for the internet. I had to apply/fill out a form four times before they would re-install access to the English Companion Ning. However, their renewed access is pointless – the site won't load correctly so what's the point if I can't read it? We're not even allowed access to google docs – how does that help students? There are state standards related to teaching students web 2.0 skills, yet teachers are shackled by district mandates. Bleagh. Such a shame. I was surprised at the extent of the problem after reading these comments. I can't imagine how teachers manage to integrate technology with such impositions. this makes me cry. tears. It is pretty sad. I can't understand why teachers are not trusted to use their preferred browsers, particularly when their choices might make it easier for them to use the tools they want to use to teach.